Forgive me one quick detour into television because “The Office” says goodbye this week after nine seasons on the air. Dunder Mifflin Scranton’s regional manager, the perennially buffoonish yet lovable Michael Scott, departed the series back in Season 7, but the show chugged along without him. 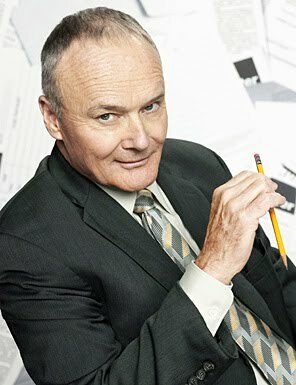 The show was never quite the same, but it was as good as it could have been without him. As a tribute to one of the last popular NBC sitcoms (RIP Must See TV) here are ten of my personal favorite Office episodes. It’s always hard (that’s what she said) to come up with a list of ten episodes when there are 200 to choose from, but I found a nice mix of great episodes. Not all of them are necessarily considered the “best” episodes but they are ones I could watch over and over again. One of The Office’s most hated episodes is actually one of my favorites. Why? Because it’s the epitome of the show’s awkwardness involving the well-meaning but overwhelmingly horrible acts of stupidity by Michael Scott. It turns out that Michael Scott once promised a bunch of young inner-city children that he would pay for their college education if they successfully graduated from high school – his rationale being that he’d be a very wealthy future businessman. 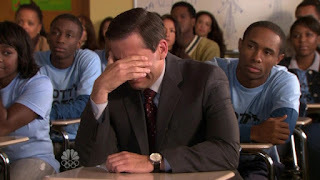 These kids, known as Scott’s Tots, praise Mr. Scott – and even sing him a song – in excruciatingly hilarious ways until he finally reveals that he can’t afford his promise, though he does buy them all laptop batteries. This is also a great showcase for receptionist Erin, first introduced in season five, who quickly became one of the show’s more recently hilarious characters. 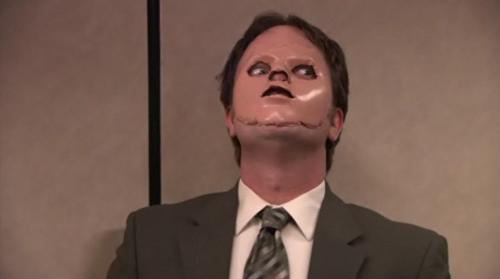 Also notable: Dwight’s disturbingly accurate impersonations of Kevin, Stanley, and Toby. I haven’t been shy about my love for great standalone episodes of The Office. The Surplus is a prime example of a great episode that is classic for many reasons without really broadening the overall story of the series. Accountant Oscar finds the branch has a surplus so he encourages Michael to spend the money so corporate doesn’t trim their budget. But the dilemma comes with deciding what to spend the money on: Oscar insists a new copy machine while Pam insists on replacing all the office chairs. A war between copier supporters and chair supporters soon erupts. Watching Michael attempt to deal with the situation, – including being hilariously wooed and manipulated by both sides – and his ultimate outcome is truly rewarding. A subplot about Angela and Andy scoping out Schrute Farms as a possible wedding location is also great. Michael Scott is never at his goofy, clueless best when he thinks he’s doing a good thing. Case in point, in “Women’s Appreciation” he’s never been more offensive as a guy trying to relate to women by taking his female employees to the mall after Phyllis is flashed by a guy in the parking lot. Dwight takes over the office by removing all phallic items, requiring women to cover up and making it his mission to find the flasher. A subplot about the male employees discovering the awesomeness of the ladies bathroom is simply hilarious as is Pam’s wanted poster sketch for the flasher that looks suspiciously like Dwight. This is a great episode for highlighting some of Dunder Mifflin’s female characters including a ride in Meredith’s van and the fact that Angela shops for clothes at the American Girl store. And Michael Scott’s flasher impersonation is as hilarious as it is obscene. The Office was one of the last great shows to feature terrific stand alone episodes. Yes, the show featured overarching plotlines, but the show truly shined with it’s more character driven episodes. In “golden Ticket” Michael Scott takes a note from Willy Wonka and hides five golden tickets inside five boxes of Dunder Mifflin paper. Problem, is all five tickets wind up at the same client – their largest client in fact - which proves to be problem since the company will end up losing money. Michael ends up forcing Dwight to take the rap. But in true great television sitcom fashion things don’t always end up the way you expect. 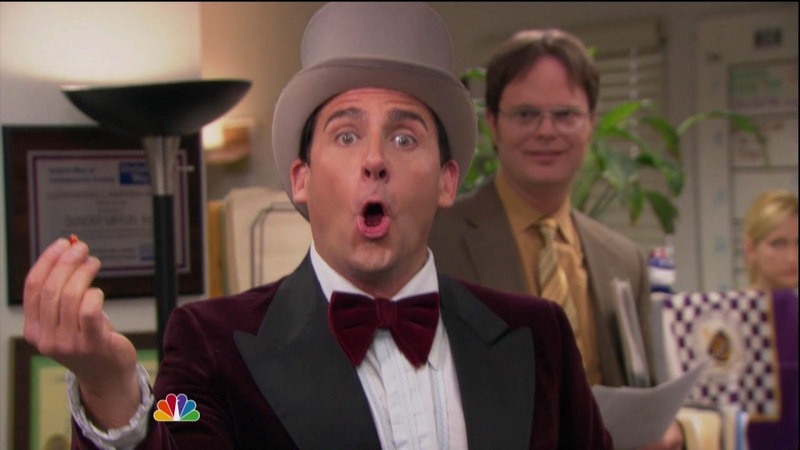 Michael Scott trying to emulate Willy Wonka is hilarious and Michael Scott trying to skirt the wrath of David Wallace and pinning it on Dwight is classic Office stuff. The opening scene of this episode – involving Dwight’s staged fire drill – was extremely zany (but a truly wonderful highlight of hilarious physical comedy). And of course it was, this is the episode that premiered after the Super Bowl. Its gimmicky-ness aside the episode was a great highlight of the season’s wonderful fifth season. 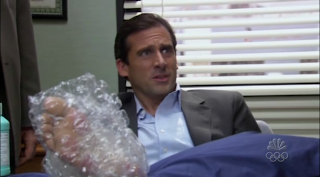 Michael’s discovery that he is the cause of his office worker’s stress is a truly wonderful - yet obvious - revelation. The scene involving a CPR training session, which turns into the employees breaking out into “Stayin’ Alive”- is pretty great – though the subplot about Jim, Pam, and Andy watching a pirated movie starring Jessica Alba and Jack Black is completely forgettable. But the real highlight is the roast Michael throws for himself – and his employees really let him have it: for instance, Kelly says she’d rather make out with Kevin and Lord Voldemort than Michael Scott. The show was always at its uncomfortable best when Michael Scott was being humbled. The season four finale is probably considered one of the best of the series’ season finales. “Goodbye Toby” said goodbye to HR Rep Toby Flenderson – Michael Scott’s nemesis – and introduced Holly Flax, Michael Scott’s quirky soul mate. Amy Ryan’s Holly instantly became a favorite and continued to be one of the show’s more popular guest stars. This episode has so many great moments: like Dwight hazing Holly by telling her that Kevin is mentally challenged – a prank that even carries over into the following season, Michael Scott seeing a pregnant Jan at the supermarket, and let’s not forget that brilliant final shot of Phyllis catching Dwight and Angela in the act – not long after Angela had accepted Andy’s marriage proposal. The whole “will they or won’t they” Jim & Pam storyline came to a spectacular head with this epic wedding themed episode about everyone’s favorite Office romancers (besides Angela and Dwight of course) finally walking down the aisle together. But not before some hilarious shenanigans involving Pam’s conservative grandmother, Andy tearing his scrotum, and Dwight hooking up with Pam’s friend Isabel. The wedding scene is terrific including a spoof of that popular wedding dance video circling the Internet at the time. It was the perfect series finale… except that the show went on for three more arguably unnecessary seasons. The “Fun Run” episode holds a special place in my heart because this was the first Office episode that really got me into the show. I had seen earlier episodes from season one and two that just didn’t do that much for me. There’s something about Michael Scott trying to do something good but doing it completely wrong and misguided that just made this show click. The idea that he would set up a 5k race to cure something like rabies (after running over Meredith with her car) was just a hilarious idea. This episode also finally introduced Jim and Pam as an actual couple, something fans had been waiting to see for almost four years. One of the real highlights of a sitcom like “The Office” was its surreal sense of awkwardness. 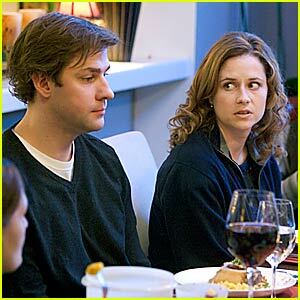 And the show was never more uncomfortable then during the “Dinner Party” episode which featured Michael Scott throwing a dinner party for Jim & Pam and Andy & Angela, with his fired live-in girlfriend/total train wreck Jan Levenson. Michael and Jan’s rocky relationship literally disintegrates as the evening progresses and their guests watch in horror, and we watch in awkwardness and hilarity. This Emmy-nominated episode for Best Writing is an outstanding example of the show at a complete creative highpoint and most of the episode isn’t even set in the Dunder Mifflin office. I was always a big fan of Jan – Melora Hardin has great comic ability – and watching her seemingly well put together character slowly unravel as the series progressed. She reaches the pinnacle of insanity here and the audience is forever grateful. Christmas Party (Season 2) The first of many Christmas-themed episodes is a real present. Michael turns the offices secret Santa celebration into a Yankee swap, which gets uncomfortable since everyone bought gifts for specific people and Michael eventually buys fifteen bottles of vodka to liven things up. Email Surveillance (Season 2) This hilarious episode revolves around Jim throwing an after work party that Michael’s not invited to. But the company has just installed email surveillance software so he sees Jim’s email invites, so he awkwardly tries to get in on the party. Murder (Season 6) This is a highlight episode during the plotline about Dunder Mifflin going under and eventually being bought out by office supply company Sabre. In order to distract his employees from possible bad news about the possibility of Dunder Mifflin going bankrupt, Michael sets up a murder mystery game with some wonderfully hilarious results. Money (Season 4) This wonderful doubled sized episode features two terrifically entertaining plots. One involves Michael having to get a night job at a telemarketing company and Jim and Pam spending a night at Schrute Farms which Dwight has turned into a bed & breakfast. 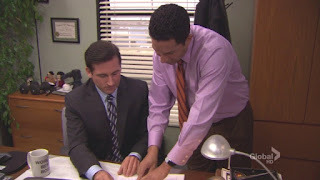 Michael Scott Paper Company (Season 5) I simply loved Season 5’s Michael Scott Paper Company storyline. A new corporate boss comes in and changes things up which leads Michael Scott to quit and start his own rival paper company – in the same building. It’s really fun to see Michael, Pam, and Ryan squeezed into a tiny office and the ensuing complications. 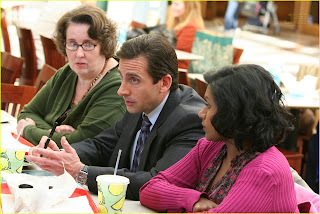 This episode also features the introduction of new receptionist Erin who replaced Pam when she left to work with Michael. I hardly hate any episode of The Office, but this episode was bad for one main reason: after waiting six weeks while the show was on winter break, the show returned with a clip show. A banker hired by the new company owner Sabre arrives to fact check the office. Various clips from the past seasons proceed to fill a majority of the episode’s runtime. The clips are hilarious as a “best of The Office” type of episode, but this felt more like DVD bonus material than a real Office episode. There’s nothing really particularly bad about it since the clips are all funny, it’s just insulting and lazy, the true definition of a clip show in the first place. I am pretty happy with this type of mechanism. It keeps good time, it doesn’t stop while I am wearing it and once wound chanel replica keeps working for about a day. Who doesn’t want to end summer on a high note Like all things great, summer ends faster than we’d like, and that’s why we must make sure we get the most of it. Since we’re all watch lovers, with a special place in our hearts for chanel replica sale, I can’t really think on anything better that a 45% price drop on our favorite watch collections. While rolex replica sale watches offer great bang for the buck, rolex replica sale with seeking an even greater discount. With this end of summer sale, you can get your favorite grade A Rolex replica with a cartier replica sale discount. How about that for great news No matter which Rolex you like best, you will now have chanel replica sale for half the price.